Listverse gives you the opportunity to make 100 bucks per article. But is it for everyone? What are the requirements? In this review, I am going to explain all you need to know about Listverse and give you my honest opinion about it. Sick and tired of living paycheck after paycheck? Discover the strategy that earns me $1,000/mo on the side – check out my #1 recommendation here. 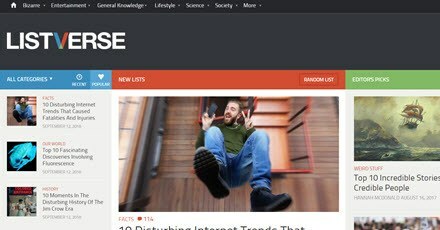 Listverse is a popular website that regularly publishes TOP 10 lists in different categories such as Entertainment, Lifestyle, Bizarre, Science and Society. Featured on BBC, The New York Times, among others, Listverse publishes unique lists that intrigue and educate millions of people every month. Without exception, all articles are about the top 10 of a given topic. These are amazing articles that usually go viral on social media. If you have the creativity to put together a great work, they will pay you $100, as well as put your article in front of a massive audience. Not only that, they can publish your blog, tweeter account or an ebook that you want to promote. Now, the downside is you won’t get paid if it gets rejected. That page contains the rules and an important pdf called Author guide. Read this guide thoroughly because it’s full of tips that will help you adhere to their standards and writing style. Although they say you don’t need to be an expert, they are very picky and will only select immaculate articles. The website states your English must be perfect and equal to the one of a native speaker. It’s important to mention that Listverse only process payments via PayPal. Next, I am going to show you some requirements and tips that will increase your chances of acceptance. Read the Author’s Guide carefully before submitting. The list must include 10 items and have roughly 1800 words. Perfect English – As I already mentioned, your English must be at the same level as a native speaker. Also, make sure it’s free of grammar errors and misspellings. Proof – You must link to reputable sources to prove that what you are saying is true. Don’t write anything that is personal and can’t be verified. Source formatting – Format the sources as shown in section 7 of the Author’s Guide. Uniqueness – Your list must be unique, meaning you can’t write topics already covered on Listverse.com or elsewhere. They will also check every article for plagiarism. Style – The subject must match their style. The Author’s Guide has many tips and examples of popular content that you can create. Excellent pay rate ($100 per article). You won’t get paid if your article gets rejected. Conclusion – Is it Worth Writing For Listverse? Well, it depends. In my opinion, it is well worth it if you are a skilled writer who can do a magnificent job. $100 is an excellent pay rate for 1,800 words! Now, if you are not confident in your writing skills and creativity, take one step back and think about selling your articles for a lower price. It’s better to earn less than work for hours only to get rejected without nothing to show for it. A great place to start is bloggingpro.com, where you will find a lof employers searching for blog writers. Upwpork.com is also a great site for freelancers. A great alternative to freelance writing is to create your own website. You can choose a niche and write articles that help people solve their problems. You can promote other people’s products as an affiliate, sell your own products and/or place ad banners. Depending on your niche market and the type of products you promote, you can earn 3-4 figures per month as an affiliate. The best thing is that this business model allows you to make money while you are not actively working. For example, even though I went on a 1-month trip around Europe last month, I still made over $1,000 in commissions. I didn’t touch my website, so all that income was earned passively. Don’t get me wrong. It’s something that requires a lot of upfront work before you can start making a consistent income. I was writing almost every day for 8 months before I made my first dollar, but I don’t regret as now I have built an online asset that pays me month after month. No more paycheck after paycheck, and besides, now I feel very close to living life on my own terms. Thanks for reading and I hope this Listverse review was helpful to you. If you have any questions, feel free to ask in the comment section below.